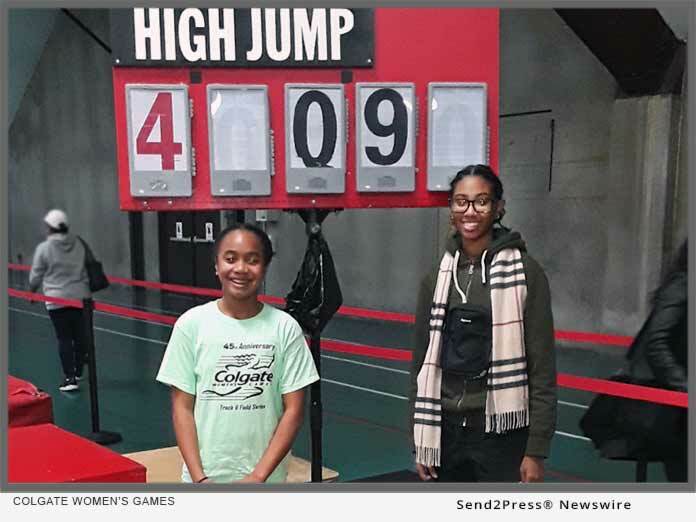 BROOKLYN, N.Y., Dec 27, 2018 (SEND2PRESS NEWSWIRE) -- Rising young stars and returning champions from all over the East Coast shared the spotlight at the second preliminary of the Colgate Women's Games (December 21-23, 2018), the nation's largest amateur track and field series for women. Thousands of girls and women from first grade through college and beyond, many traveling from as far as New Hampshire, Massachusetts, Virginia and Georgia chose to celebrate Christmas weekend on the track at Pratt Institute in Brooklyn. Friday, in the High School division, Rori Lowe of Columbus High School in the Bronx, scored another personal best with her second consecutive win in the 55 meters, (7.2); Two time Junior Olympic Champion Peyton Rollins of Buckingham Brown & Nichols School in Cambridge, MA, won the 55 meter hurdles in 8.28; Brianna Brown of Collegiate Institute for Math in the Bronx, won the 200 meters in 25.49; Kaitlyn Cepeda from Park East High School in Manhattan won the 400 meters in 58.90, improving nearly two seconds over last week's performance; Adia Palmer from Bishop Loughlin High School in Brooklyn, won the 800 meters in a new personal record, 2:18.49; Isabel Stronski of Rye Country Day School in Rye, NY, won the 1500 in 4:58.36, nearly a seven second improvement over last week's win; Two-time Colgate Games' High Jump record holder, My'khiyah Williams of Benjamin Banneker Academy in Brooklyn, cleared 5'4 for the win; and Holly Charles of Paula Robeson High School in Manhattan won the shot put with a new personal best toss of 11.49. Meet Director Cheryl Toussaint said, "We're so pleased by the overwhelming turnout of participants and their families this Christmas weekend in Brooklyn, cheering on their girls as we celebrate the 45th Anniversary Colgate Women's Games. We saw improved scores and more exceptional performances in every division." Saturday in the Mid School division, national sprint sensation and four-time Colgate Women's Games' record holder Avery Lewis of Westtown School, West Chester, PA scored a second consecutive double win. Lewis won the 55 meters in 7.15 and achieved another milestone with her fastest Colgate Women's Games 200M in 25.37. Taleea Buxton of Young Scholars Charter School in Philadelphia, last year's first place champion, set a new personal record in the 55 meter hurdles in a swift 8.31. Junior Olympic Champion Eyota Bey of Cedarbrook Middle School, also in Pennsylvania, a Colgate Women's Games finalist since elementary school, won the 400 meters in 58.99. Juliet Salazar of Peekskill, NY scored a double win in the distance races, winning the 800 meters in 2:26.34, and the 1500 meters in 4:58.62. Rowan Houston of Rye Country Day School cleared 5'0 in the high jump, and Prizila Negrete of Sacred Heart Grade School in Yonkers, tossed the shot put 8.92 meters for the win. Sunday Elementary B highlights included three double wins. Returning champions Amirah Nesmith of St. Helena Incarnation in Philadelphia, won the 55 meters in 7.63 and 200 meters in 27.97; and Da'Mira Allen of Chichester Middle School in Boothwyn, PA won the 400 meters in 1:02.29 and the 800 meters in 2:25.04. Kiara Davis of Wilbur Elementary in Bear, DE repeated both her record-tying jump at 4'9" and 55 meter hurdles in 9.78 for two more wins. Hopeful young track stars, parents, coaches and recruiters can find information about the program and follow results at https://www.colgategames.com/results.